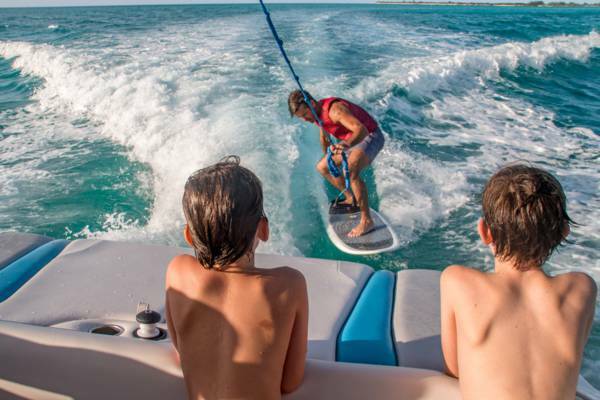 Wakeboarding on the incredible waters of the Turks and Caicos with Wake to Wake Watersports. Wakeboarding with Wake to Wake Watersports. 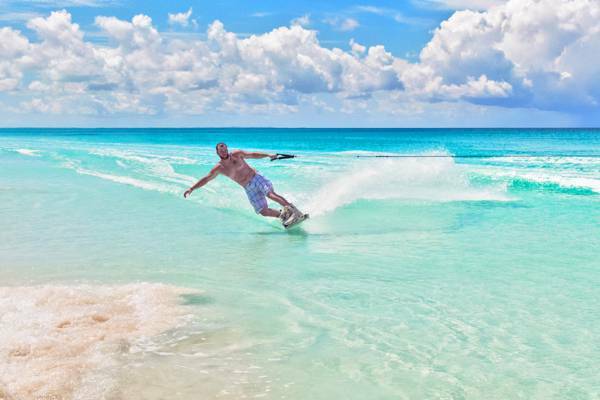 Providenciales and the Turks and Caicos is a great destination for wakeboarding. You’ll find crystal turquoise water and sheltered flats. 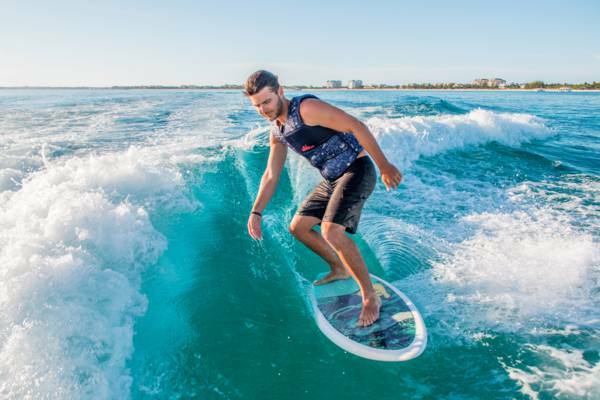 The entire rage of wake sports are typically available from our local tour operators, including wakeboarding, wakesurfing, water skiing and tubing. If you haven’t had much experience with board sports (snowboarding or kiteboarding) before and just want to have fun on the water without investing time to learn, you may want to consider tubing. 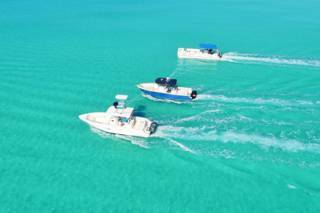 Due to the expertise required to captain a vessel in the challenging waters of the Turks and Caicos, and the associated safety risks, all excursions are guided and boat or equipment rentals are not offered. Wakesurfing at Grace Bay with Wake to Wake Watersports. As is also the case with many other popular water sports such as snorkelling, kayaking and paddle boarding, calm, windless and glassy conditions will typically give the best time on the water. The Turks and Caicos generally experiences an east southeast trade wind, which allows for flat spots on the leeward (western) sides of our cays and islands. The best locations close to Providenciales are usually off the east side of the island in the Princess Alexandra National Park at Donna Cay and Little Water Cay, or off the north of Half Moon Bay and Water Cay. You’d be hard pressed to find spots in other Caribbean regions that match the natural beauty of these locations. The southwest coast of Providenciales near Sapodilla Bay and Taylor Bay can also have decent conditions at times, as well as the beautiful Grace Bay. Wakeboarding can be enjoyed by all ages. Photo by Wake to Wake Watersports. It takes a bit of practice to be able to wakeboard or water ski, and our local companies offer a complete range of beginner lessons, certified instruction for higher skill levels, and equipment appropriate for all ages. The wakeboarding and water skiing sports are suitable for a wide age range, and even children as young as seven or eight can begin, so the whole family can participate. It of course varies by person, yet instructors are able to get most on the water within an hour or two. Rates are typically based on the time out on the water per boat, and start at about $300 per hour, with full-day rates at $1200-2000. 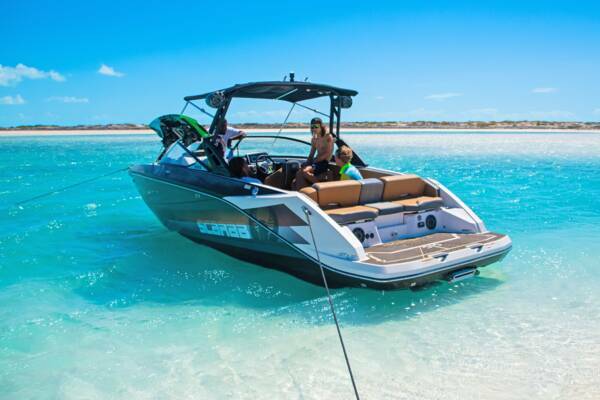 Wake sport boats tend to be small, so excursions are typically private charters. Dedicated Mastercraft wake sport boats are the vessels of choice, and offer better handling and wake conditions than other boats. Wakesurfing requires a larger vessel capable of creating a bit of a wave, consequently may demand a higher hourly rate. Local businesses typically provide all necessary equipment, and have great gear and a wide selection of boards. Tours often depart from either Grace Bay Beach in front of the resorts, or at a local marina. If necessary, land transport is often complimentary. Wakeboarding with Talbot's Adventures off of Water Cay. We advise contacting the water sports business directly to get the best price. Be aware that the Turks and Caicos experiences predictable tourism seasons, it availability may be limited at times. We advise making reservations well in advance of your arrival date. Although losing ground to Wakeboarding, water skiing is still a popular water sport in the Turks and Caicos. Like wakeboarding (and as is the case with most of the exciting water sports), water skiing takes a bit of practice to pick up. Businesses offer instruction, but once you get an explanation of the basics, it just takes some practice.